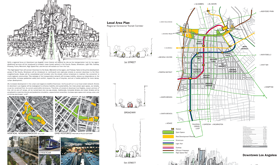 In March 2009, the Southern California Institute of Architecture (Sci-Arc) and the Architect’s Newspaper launched an international ideas competition to challenge urban designers to rethink the relationship between transit systems, public open space, and real estate development. 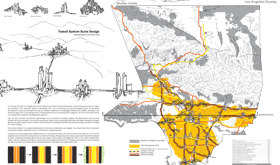 MOCK Studio submitted its idea of using the existing freeway right-of-way to develop a high-speed network of trains that would create super transit-oriented districts (TODs) that bridge the physical and psychological divides of the old freeway system. Over time, this retooled infrastructure would replace the need for automobiles where thousands of acres of open space could be reclaimed by removing vehicle lanes. Future development would be funneled to downtown Los Angeles and commercial corridors where improved pedestrian amenities, complete and green streets, local streetcars, citywide bus and light rail lines, and inter-city high-speed freeway trains would connect Southern California to a revitalized core. For more information about the competition and to view a list of the winners, click here.